Today is my 41st Birthday. Hard to fathom… Seriously, I kinda feel as though I am catching up to my parents who are in their 60’s. Today I was awakened by my two very sweet 4 year old daughters with breakfast in bed of OJ, and toast with peanutbutter. Coffee came soon after. Riley was born in the summer of 2007 and her big sister Meron came home a short 12 days later from Ethiopia in the arms of her jet lagged papa. Meron is quite excited that today is my birthday because “MINE IS NEXT” and “I WILL BE FIVE”. My birthday always finds me reflecting on my past. The decision to join with the amazing people of EOR was made in a instant while making a left hand turn onto Taylors Ferry Road in the Fall of 2007. It was a life changing decision. A path taken by myself and this family into service. Thanks to all EOR’s loyal supporters. We seriously couldn’t do it without you. Happy Birthday to ME!!!! Life has a funny way of unfolding sometimes. Over the course of my life, I have come to believe that some things happen for a reason. I remember the first Christmas after we came home with our son from Ethiopia like it was yesterday. We were living outside of Washington, D.C. at the time, getting ready to move to Ohio where we didn’t know many people. What a year it had been; and in the whirlwind of packing, gifting and saying good-byes, I was on a mission to make all of my Christmas gifts to family members significant to Ethiopia. Specifically, I wanted to purchase gifts for others where the proceeds would benefit Ethiopian children. I researched online, and found that a non-profit called Ethiopian Orphan Relief had a little online shop with Ethiopian jewelry and scarves. All of the proceeds went to help Ethiopian orphaned children. I bought my sister-in-law a necklace and found a necklace that I LOVED for my husband – and myself. 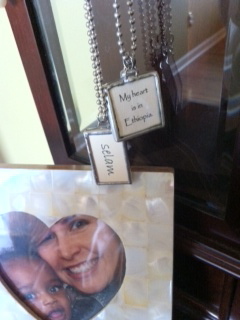 It read, “My Heart Is in Ethiopia.” But at the online check out I found there was only one in stock. Bummer. I bought it for my husband, who loved it. A couple of months later, we had moved to Ohio (where I still knew next to no one) and found myself sitting at Paige’s dining room table. I had just met her after hearing about a local group of families and volunteers planning Columbus’ upcoming Enkutatash celebration. As Paige talked about Enkutatash, she frequently referred to things she had done for “EOR.” Confused about the acronym and a little bit shy, I sat quiet for a while. Then, finally, I interrupted. “Ethiopian Orphan Relief,” she answered. She said a few more things about how she and a group of other adoptive moms had started EOR, but I didn’t really hear her because of the loud “CLICK” that had just gone off in my head. “You mean, the non-profit that sells that necklace that reads, “My Heart Is in Ethiopia?” I asked, sounding ridiculous (because yes, I knew EOR did more than sell necklaces. But I was just putting pieces together and absorbing this new information). “Yup!” Paige said cheerfully, and continued on with whatever she was talking about. I couldn’t focus on what she was saying though because I was kind of in awe of Paige’s awesomeness and surprised by the connection I had just made. Paige, who stood before me, had helped start that great non-profit I had bought our Christmas gifts from? WOW, the world is small! Once again, I secretly hoped I could one day get involved with an organization like EOR. And overtime, I did. As I became closer friends with Paige (and the group of wonderful women who have become our “Tribe” in Ohio), I began helping Paige out with EOR projects in small ways when and where she asked. I was honored when she asked me to help her plan the Dead of Winter Bash (held last month). And when she asked me to be a board member, I could barely hear what she was saying because of the loud “CLICK” that once again went off in my head. Things do happen for a reason, and life really does have a funny way of unfolding. I was reminded of this again as I perused the items to bid on at the Dead of Winter Bash – and came across a necklace similar to the one I I had bought for my husband on our first Christmas home from Ethiopia. So now I have finally one too, to (almost) match the necklace I bought my husband a few years ago. And though it means something very different today than it did back then, our hearts really are in Ethiopia. 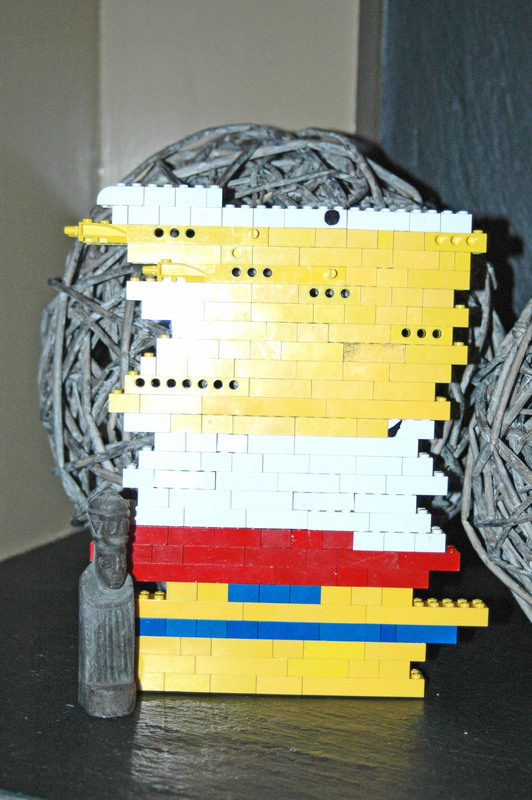 Most of the new bricks (the white and yellow layers) were gifts to Noah F. in St. Louis. Noah (who is newly 5) chose bricks over toys for his birthday gifts–isn’t he fabulous? Thank you handsome Noah. YOU are EOR! Speaking of fabulous, I can’t wait any longer to introduce you to our newest board member (yep, another–we’re growing in leaps and bounds! ), the fabulous Alex Dedels. Alex hails from DC, but currently lives here in the greater Columbus area. 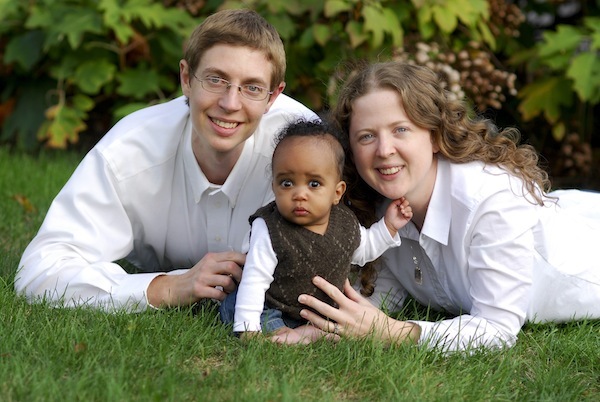 Alex and her husband Dan are parents to the terrific E, of Ethiopia, and sweet baby R, who was adopted domestically. Alex was a key volunteer for The Dead of Winter Bash, works hard to plan the local Enkutatash celebration, and she is a good friend besides. We are SO pleased to welcome her to the board, especially as she joins the fundraising team. Please join me in welcoming newest board member, Amy Harcar! I met Amy more than 3 years ago, at an Ethiopian Tewahedo Social Services event for adoptive parents. Amy & Joel were just starting their adoption journey, but were eager to learn all that they could about Ethiopia and adoption. We became fast friends and co-volunteers as we worked to plan the local Enkutatash celebrations. 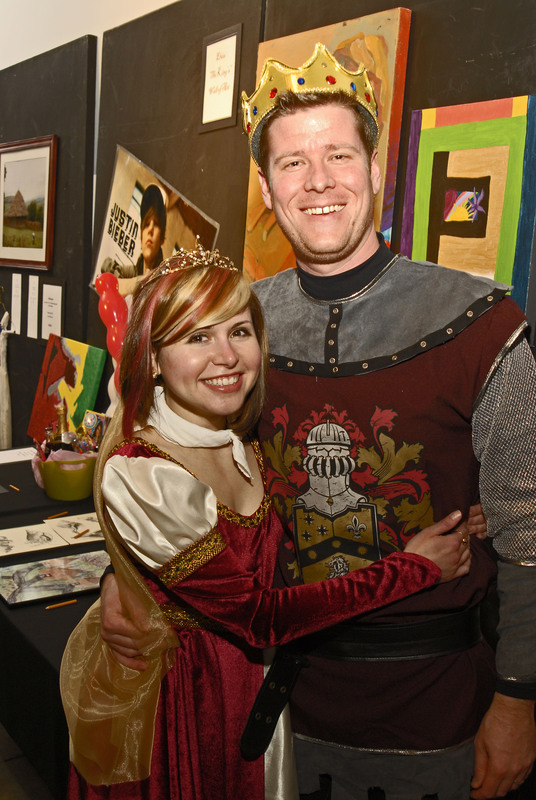 In addition to planning Enkutatash, Amy & Joel have always supported the work of EOR, working especially hard to plan the very first Dead of Winter Bash held earlier this month, so I was thrilled when Amy agreed to join the board. Amy will serve as secretary for EOR. We are so glad she has chosen to join us. Thanks Amy (& Joel, and Tesfa). YOU are EOR! EOR is excited to introduce our newest board member to you. Molly Curran is a familiar face to many of you. She has been a EOR volunteer the past few years and recently accepted the position of board member and our fundraising chair. 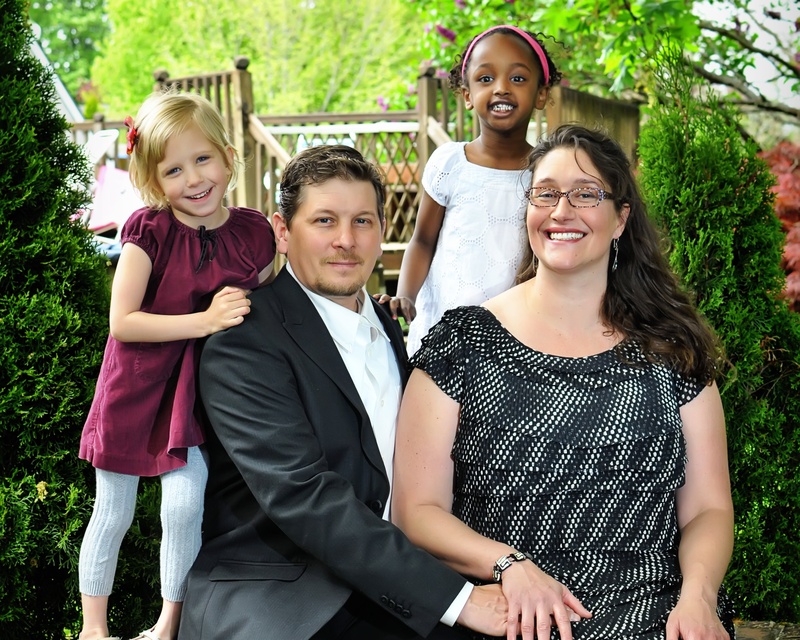 Molly and her husband Joe reside in Portland and have two boys and a daughter. 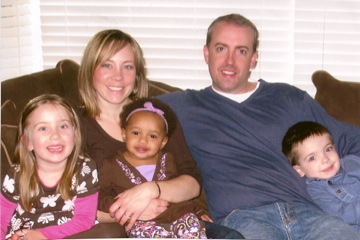 Their daughter Hana was adopted from Ethiopia in January 2007. Whenever we have put the call out for help with an EOR project Molly is always there. 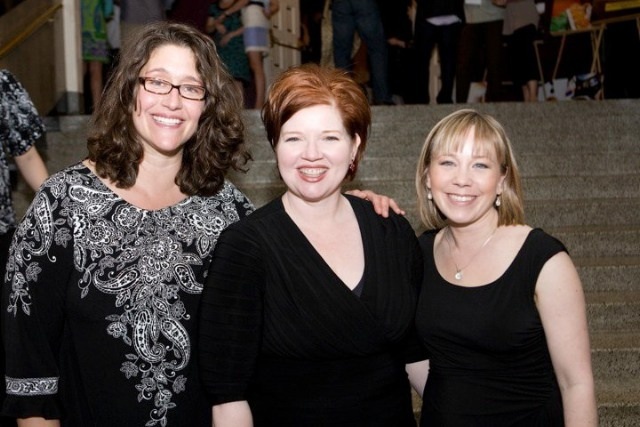 She’s been actively involved with the planning of Lights of Hope the past few years and will now take on the role of Auction Chair along with Lauren, Jenny and Kim. She hails from Minnesota, is a grad of Notre Dame and always the hit of the party! Welcome to the EOR family Molly. Katie joined the EOR family a few years ago. She was first one of our “official” volunteers and then became a board member a year after that. Katie is the EOR secretary and also co-chairs the Tasfa event in Colorado. When we think of Katie we think of sense of humor, calm, a passion for orphans, and a multi, multi, multi tasking Mom. Katie is the mom to 8 children, five of them from Ethiopia. During her “spare-time” she finds time to grow her own garden, tie-dye her kids tee-shirts, be an advocate for HIV + orphans, orchestrate her family of 10 activities and still finds time in her day to share with EOR. 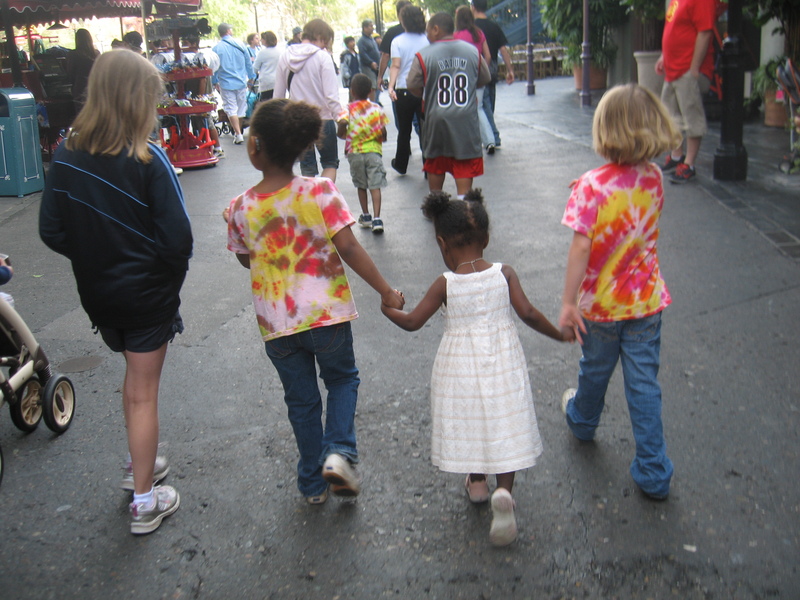 This past spring my family was visiting the happiest place on earth and so was Katie’s family. We made plans to meet and she casually said “you can’t miss us, were all in matching tee-shirts.” We met at big thunder mountain and introduced our children. I was in awe of how calm Katie was. Here I was with two children and my niece and I was a nervous nelly trying to keep track of the three of them, yet Katie with her 8 children was calm as can be , just casually counting kids 1,2, 3,etc. 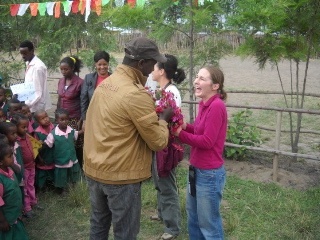 In November Katie traveled back to Ethiopia and visited our partner organizations, Lola and FOVC. While their she worked with the kids on art projects, talked about future needs and butchered her first LIVE chicken. Katie recently paved the way with our newest partner Lola, a HIV + orphanage in Mekele, Ethiopia. Thank you Katie for all you do for EOR, for your sense of humor, and for the undying passion you have for the children in Ethiopia. Many of you know the love we all have here at EOR for Ethiopia and the people there. When we all started this non-profit it was to give back to our children’s homeland who has given us so very much. We are humbled and in awe of the generosity so many of you have given. From a high school friend not seen in 25 years, to a 10 year old girl who shared every penny she saved for a year, the kids who had summer lemonade stands, the gifts given in memory of a lost loved one, to friends who put together backpacks, sewed dresses, raised their paddles at Lights of Hope and Tasfa, cried with us, celebrated with us….we say thank you. Thank you for being you, thank you for make a difference in an orphans life, thank you. You all hold a special place in our heart for the generosity you have given. Were excited to see what 2011 will bring to the orphans in Ethiopia. YOU have made a difference. Here is a short video of the smiles of the children in Ethiopia who were touched by your generosity. May your 2011 be great!! Kim Pasion, President ~ Ethiopian Orphan Relief, Inc. When we all think of Jenny we think of calm. She has this amazing calming spirit. It can be the hour before Lights of Hope (EOR’s Portland event) and Lauren and myself are frantic yet Jenny is right beside us smiling and calm as ever. She is truly amazing. Jenny joined the EOR family this past year and is our Treasurer. Along with those duties she also Chairs the Lights of Hope Auction, volunteers at Day of African child and much more. 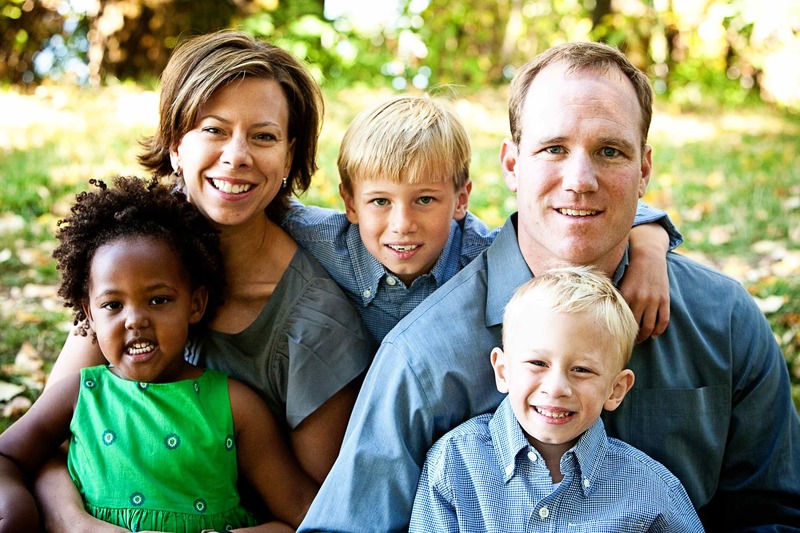 Jenny is the mom to four adorable children, two girls, two boys, two who are from Ethiopia. In her “free time” she can be found volunteering with her children’s school, helping with the extended family business and searching for ladybugs. Yes, you read that right searching for ladybugs. This past June EOR board member Lauren was turning the big 40. In her honor we threw her a surprise birthday party. Jenny loves gardening and her gift to Lauren was a HUGE hanging pot. While shopping for that perfect hanging pot she also picked up 1500 ladybugs. Jenny then proceed to arrive my house, when I opened the door there she stood with her usual beautiful smile and happy self. She then tells me that her children had just opened the container of 1500 ladybugs in her car and that ladybugs were all over the place. She was so calm while telling the story. I don’t think I’d be so calm. I told her think of all the great luck that will be coming your way with 1500 ladybugs. A few months later she received her referral on her 4th child. Thank you Jenny for all you do for EOR. Thank you for your friendship and the great example of compassion and faith that you share with all of us. Jenny and family...in a few months baby boy #4 will join the family. Let’s start with Paige our Vice President. This lovely lady hails from Ohio and is the proud mom of two children, one from Ethiopia. Paige has been an EOR board member since pretty much the start. She wears multiple hats at EOR! Along with her VP duties, she also is our newsletter editor, in charge of our blog, the chair of our annual fundraising campaign and is chairing the Dead of Winter Bash in March, plus lots more. How she does all of this is simply amazing as she’s also a stay at home Mom who shuttles two kids to school, multiple activities, is an exceptional cook, makes beautiful crafts and so much more. She also has flown out for every EOR event from Colorado to Oregon. I was truly in awe of Paige’s grace & dignity this past May 8th. It was the evening of Lights of Hope, EOR’s fundraising event here in Portland. Paige had just learned a few hours prior that her Dad had passed away unexpectedly. This was devastating news yet Paige with her grace stood before the guests and showed her support of EOR. Paige shined that night and I remember thinking how proud her Pops would be of her at that moment. Paige holds a extra special place in my heart as she met my daughter before I did. While in Ethiopia bringing her daughter home she was able to take photographs, hold and love my baby and tell her that soon we would arrive to bring her home. Thanks Paige for all you do for your daughter’s homeland. We are honored to have you as part of the EOR family and thankful for all the things you do.